In the beautiful Saint Symphorien Cemetery near Mons in Belgium lie two men linked by a sad coincidence. The military cemetery is dedicated to the fallen of the First World War which was said, at the time, to have been the war to end all wars. At rest are 284 German and 229 British soldiers - though this includes Irish and Canadian soldiers. Two memorial stones face each other, perhaps just a few yards apart, separated by a strip of grass. At rest are Private John Parr, from Finchley, London and Private George Edwin Ellison from Leeds. Both were of the Royal Irish Lancers. The two soldiers are the first and last British soldiers to be killed in WW1. Pte. Parr died August 21, 1914 and Pte. Ellison was killed on the morning of November 11, 1918. Both lost their lives within two miles of the cemetery. It might be thought that the two soldiers were placed opposite each other because of their significance or symbolism, but this turns out not to be the case. Where they lie happened purely by 'coincidence'. The Independent newspaper made enquiries about the positions of the memorial stones with the Commonwealth War Graves Commission. Peter Francis, spokesman for the Commission said, "It is a pure coincidence. John Parr's body was placed where it is now by the Germans in 1914. George Ellison's body was brought to the Saint Symphorien cemetery from a temporary burial place after the war. Our records suggest that Pte. Ellison was simply buried in the next available space. It was not then realised that he was the last British soldier to die in combat. Nor was the fact that Pte. Parr was the first British soldier to die established until later." 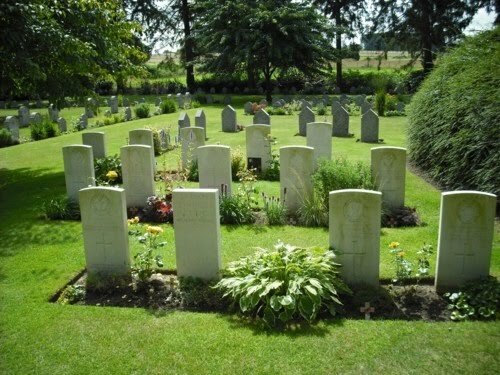 It is believed that well over 800,000 British soldiers were killed in World War I and fate has put the first and last of these opposite each other in a cemetery in Belgium. That is quite a coincidence. If only it had been right about WW1 being the war to end all wars. We never learn. So sad that so many lives have been lost. I don't buy this coincidence stuff. It happens but things like this must happen somewhere in the world what with so many people on earth. They probably knew what they were doing with the graves anyway. This one is fascinating. Anonymous - coincidence happens constantly.You just have to be aware of it. It was a coincidence that had to be revealed with time and effort and almost a century later, still a mystery to share. I think Trish & Rob and Terri have answered the anonymous comment. It took an age for the first and last soldiers to be realised.